The first ever charity games for orphanage homes in the Brong Ahafo Region is scheduled to take place on Saturday, July 28, 2018, 9am prompt. 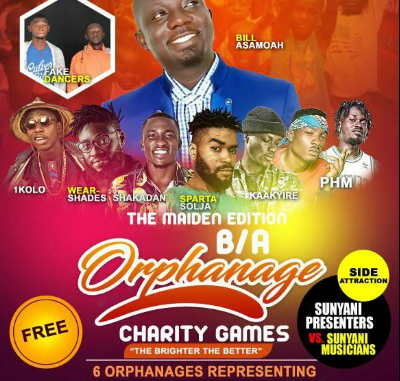 The event tagged ‘Brong Ahafo Orphanage Charity Games’ will be held at the Coronation Park in Sunyani. Six (6) Orphanage homes are expected to log horns in an anticipating soccer fiesta. Adding up to the fun, Radio presenters in Sunyani will battle with Musicians while Flying Horse faces on Young Kotoko. Abubakar Fatao, one of the organizers told the News Hunter Magazine that they will use the opportunity to create awareness on the importance of making charity a habit. He indicated that the children’s God-giving talents are likely to be unveiled as they come together to socialize. Abubakar stressed that it is necessary to make them feel that they are part of the society. 1. TO BRING THE CHILDREN TOGETHER TO SOCIALIZE AND TO LOVE ONE ANOTHER. 6. TO CREATE THE AWARENESS AND EXPOSE THE NECESSITY TO MAKE CHARITY A HABIT. The event which will kick-start around 9:00 AM on Saturday will have performances from some musicians in the region.